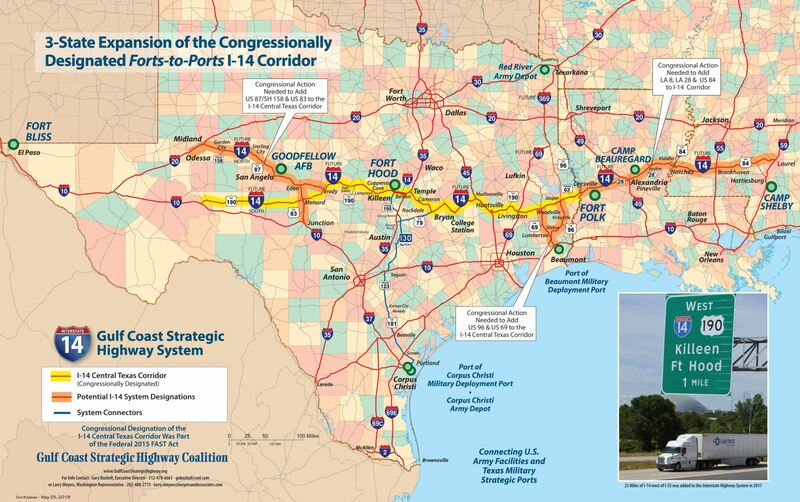 In 2015, Congress designated the first I-14 Corridor in Texas. That corridor extended from I-10, just south of El Paso, to the Texas/Louisiana state boundary in East Texas. The law specified that any segment of highway along the route built to interstate standards could be labeled as Interstate 14. In 2017, the first 25-mile section, connecting the east city limits of Copperas Cove to I-35, was added to the Interstate Highway System. This became America’s newest interstate highway. Currently, community leaders in Texas, Louisiana and Mississippi are seeking approval of a multi-state expansion of the Interstate 14 designation. The original route will be slightly modified in East and West Texas and extend through Louisiana and Mississippi to the Mississippi/Alabama state line. Congressman Brian Babin and Congressman Mike Conaway introduced HB 6111 in 2018. Congress failed to take up the legislation in the last session. It will be introduced in the current session. All members of the U.S. House in all three states have signed on as co-sponsors. Senator Cassidy, of Louisiana, has agreed to sponsor the legislation in the Senate. Senators Cornyn and Cruz have agreed to sign on as co-sponsors. We expect this legislation to be folded into the first transportation bill to immerge from the Transportation and Infrastructure Committee in the U.S. House of Representatives. Additional legislation, at a future date, will be required to extend the corridor through Alabama and Georgia to an east coast port, likely Savannah. Our staff is working with allies in those states to build community and political support for the future route. In order to achieve the goal of an interstate highway connecting El Paso to the east coast, the organization driving the process, of which we have been a member for many years, will undergo considerable redevelopment. The I-14/Gulf Coast Strategic Highway Coalition originated in, and has focused its efforts on, Texas. While the Coalition has had success, its relatively narrow focus has led to informal operations, inconsistent communications and inadequate financial support. To strengthen the organization, directors have created a Governance Committee. That committee will be chaired by Bell County Judge David Blackburn. The 14 Forward staff has agreed to provide staff support and guidance to Judge Blackburn. Activities will include strategic planning, bylaws review, policy development, membership development and communications planning.